Stepping out of the noise and dust of the massive construction site forming Marina Gate in Dubai Marina and into a completed and furnished one-bedroom apartment is a disconcerting experience. Just a few minutes earlier, clad in regulation hard hats and high-vis jackets, we were slowly climbing in a cage-like construction hoist, surrounded by labourers. The next minute, we’re walking down a fully completed tiled corridor and then we’re standing inside an immaculately furnished, air-conditioned, water-facing luxury apartment, hurriedly removing our hard hats and wiping our dusty shoes on the doormat. With the 51-storey Tower One at Marina Gate due to be completed this autumn, developer Select Group is keen to show visitors around what is one of the last major development sites fronting Dubai Marina. The three-tower development, which is located close to Cayan Tower and the Torch, is being completed in three stages with the 64-storey Tower Two due to be finished next year and the 53-storey, currently just a hole in the ground, expected to complete in 2019. Inside, the most striking thing about the Marina-facing apartment is the view, with the apartment designed so that residents get a full view of the boats on the water and the twinkling lights of the towers from the lounge, bedroom and bathroom. However, anyone concerned about the transparent glass giving other Marina visitors a view from within their apartments should invest in a full set of drapes, especially before taking a bath in the free-standing tub. Prices for a 780 to 800 square feet one-bedroom apartment in Marina Gate 1 currently stand at about Dh1.35 million. The developer Select Group is now heav­ily marketing the 389 so-called “branded” apartments in its Marina Gate 3 development, which will be built alongside 104 hotel apartments operated by Jumeirah Living. These apartments typically cost 10 per cent more per square foot than the flats in the first two towers. For that premium, Select Group says buyers will get nicer finishes and better appliances. How much have apartment prices in Marina Gate fallen since the latest slump? Our prices haven’t fallen in the entire project. Yes, we’re aware of what is happening in the market. Yes, the market has been suffering in terms of prices, but it has not affected ours or our absorption rate or our bottom line. Last month we had a great month in Marina Gate. We plan our budget to sell 30 to 40 units a month and we usually reach about that amount. What type of property is selling best? 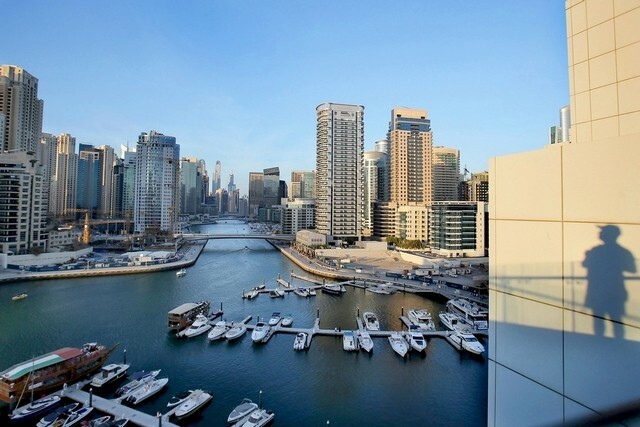 In Marina Gate 1 and 2 the units that were priced at Dh2,500 or Dh2,600 per square foot but were facing the Mar­ina were the first units to sell. We’ve got stock that was at Dh1,800 or Dh1,700 per sq ft, which are exactly the same quality and the same type of units but without the Marina view. And these sales have been during this difficult time when prices have fallen for some types of property and absorption rates have fallen for some projects. Our investor base is really wide, we sell to more than 100 nation­alities. Emiratis, Indians, Pakistanis, Brits, GCC. We had had a lot of Saudis buying, but that has slowed down now because of energy prices. Brits haven’t been a large component of our sales since we’ve had a strong dollar. We have got Scandinavians, South Americans, Egyptians – there’s still a real cross-section of buyers. All rights reserved to the initial publisher The national.